How decorative can my clothes be? How creative can I look? Two questions I am often asked by clients who contact me because they want to show up in the most authentic, creative and clear way possible. And these women often struggle if others in their department or team are dressed in a more casual or conservative manner. Yet according to a Boston consulting 2016 report...innovation is the most indemand skill for talents to possess. So how to communicate an innovative spirit and clarity with decorative clothing? The answer is using STYLE WITH A PURPOSE! One of my favourite shops in Milan is Antonio Marras. I was there twice in the last months because it is so inspiring: an enchanting clothing, furniture, object and book shop in one. Every piece is unique and Antonio Marras and his team do an amazing job editing and expressing their unique perspective. The creative spirit is so vibrant here and one of the reasons they moved here and away from the fashion centre of Milan, to have the space to create installations that evoke an artistic atelier not just an expensive clothing boutique. Antonio's artistry is alive in his poetic paintings and he translates this unique outlier spirit to his clothing where pattern mastery ranges from bold and bright to subtle and mysterious. The secret to his mastery? Well thought out color palettes that communicate the story of the collection so that the moment you walk into the shop you experience the wide variety of clothing a harmonious whole. The three items below come from the 2016 spring collection and we see the powerful editing in the subdued color palette of beige, cream, chocolate, charcoal and grey. Due to the depth of texture and appliqués this combination remains fascinating, subtle but never boring. 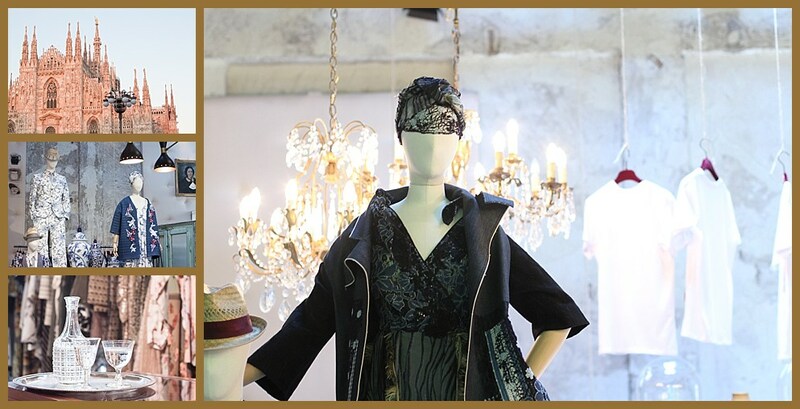 Check out the impact of the first outfit: a beige coat with the grey and black silk dress. Refined editing mastery is what takes personal style to the next level ensuring your creative look is intentional, edited and clear. In the boutique you experience a creatively intentional color palette. However effortless the impression may be this has involved hard work and careful editing. Nothing haphazard and left to chance. 1. THE SITUATION you will be wearing the outfit in. What is the challenge you are facing. 2. THE LEADERSHIP CONFLICT STYLE you will use to deal with this challenge. Authoritive is decisive, in control when speed is of the essence. Overused it can cause resentment and low self-motivation in others. Compromising works with a sense of fairness and moderation so provides a fast way forward. Over used it can create mediocrity and blandness. Cooperative creates trust ,creativity and personal growth. You assert yourself and welcome other points of view. But long discussions create analysis paralysis. Harmonizing makes you easy to work with and is stress-free short term. Long term frustrating for those who need the enagement of problem solving. Avoiding allows you to avoid entanglement in trivial issues. Over-used it creates dullness and residues of bad feelings. Some years ago I was booked to talk on dressing for your success. The boss of this large group was a beautiful gentle woman came to the talk in a brightly coloured shift dress. We talked about the fact that her choice of dress actually caused her stress because on this day she wanted to exercise her right to "avoid" and stay in the background and let me do the work. But she felt overly visible in her neon shift. I helped her understand that such a dress would be great at an event where she consciously decided to bring a high level of personal energy that aligned with the neon energy. since she wanted to look creative but was also in 'avoid leadership' mode a more subtle use of color would have served her purpose more effectively and less stressfully. I have used an example of the Marras coat and combined it with items so that the effect is one of controlled creativity that is easy to put together. Often women struggle to communicate creativity in a subtle manner and this coat paired with black would do the job.